Back in 1983, the so-called “Great American Songbook” was largely left on the shelf. Frank Sinatra, Ella Fitzgerald, Tony Bennett and others who could really sing ’em and swing ’em were not as big as they used to be, and a generation of record buyers was growing up without much exposure to the Gershwins, Cole Porter, Irving Berlin and other great composers of the first half of the century. 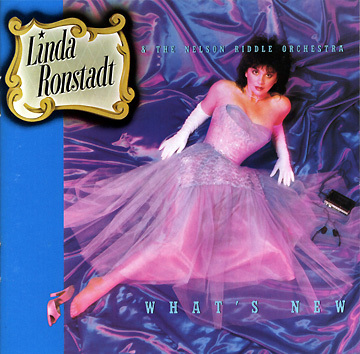 Then Linda Ronstadt, a country/folk/rock artist, hooked up with elder statesman bandleader and arranger Nelson Riddle for this album of standards that was called “What's New?” It sold well, leading to two more collaborations. This product proved that Riddle could still deliver the quality for which he became famous in the 1950s during his work with the greatest singers of that era. And to Linda's fans, it proved that she, in many ways, could rise to the level of being a great singer. Possessed of considerable yet unpretentious vocal chops, Ronstadt is a good candidate for this formidable task. She clearly reveres the music and acquits herself winningly by turning in a well-chosen, well-performed set of familiar Sinatra and Billie Holiday songs. Riddle's elegant arrangements support the lead vocals but never upstage the star. Linda's heartfelt renditions of George and Ira Gershwin's classics, “I've Got A Crush On You” and “Someone To Watch Over Me,” are our favorites. But we also like her superb interpretation of Irving Berlin's “What'll I Do?” which will linger on your lips for days. Ronstadt was a “belter” in the best traditions of the saloon-style singer. She could shake the rafters with her powerful voice. But she also could add subtle shadings and delicacy to intimate lyrics, as she proves convincingly on these tracks. Linda was born in 1946 to a prosperous machinery merchant father and a homemaker mother. She was raised on a ten-acre ranch and her family was featured in Family Circle magazine in 1953. Ronstadt’s early family life was filled with music and tradition, which influenced the stylistic and musical choices she made later in her career. Growing up, she listened to many types of music, including Mexican. She credits her mother for her appreciation of Gilbert and Sullivan and her father for introducing her to the Great American Songbook. Surprisingly, Linda turned to opera diva Maria Callas for inspiration, saying “I learn more about singing rock ’n’ roll from listening to [her] records than I ever would from listening to pop music for a month of Sundays... She's the greatest chick singer ever.” At age 14, Linda formed a folk trio with her brother Peter and sister Suzy. She released her first solo album in 1969. She also sang on TV commercials. Later, when she went on the road, Linda commented “they haven't invented a word for that loneliness... The world is tearing by you, real fast, and all these people are looking at you. People see me in my ‘girl singer’ suit. People are always taking advantage of you; everybody that's interested in you has got an angle.” This didn't prevent her from being the most successful girl singer of the 1970s. This CD is all the more poignant now that Linda, as you may have heard, is suffering from Parkinson's Disease, and has gone public with the fact that the illness has rendered her incapable of singing a note! How very sad. Yet she has left a great repertoire of recordings. This CD offers some of the best.